After five years of waiting more concrete information on Paolo Bacigalupi's first adult book since The Windup Girl has been revealed. 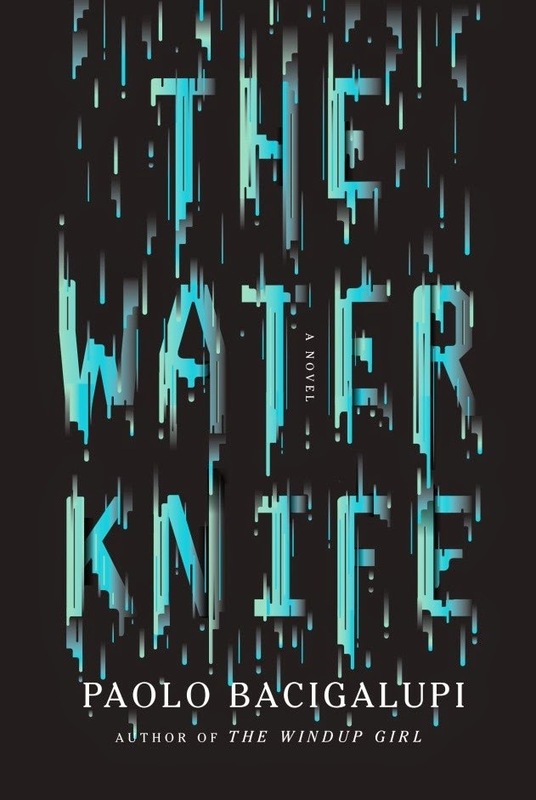 The title The Water Knife has been floating around for at least the last 2 years as he worked on his younger audience books such as Ship Breaker, The Drowned Cities, and Zombie Baseball Beatdown. Now we have the cover and a description to boot. The eagerly anticipated follow-up novel by the best-selling, National Book Award-nominated author of The Windup Girl: a scorching thriller born out of today’s front-page headlines that preys on our worst fears about potential catastrophic failures awaiting us in our resource starved future. Think Roman Polanski’s Chinatown as written by Michael Crichton. WATER IS POWER. In the very near future, the American Southwest is battling for water. Phoenix is covered in dust, desolate, and on the verge of total breakdown. Severe drought has demolished Texas. Nevada, as always, is trying to cash in. Into the fray, steps Angel Velasquez, a water knife working for Las Vegas water mogul Catherine Case. Case is in the Arcology business, opulent real estate in which lush, luxury living environments are raised out of dry earth. Zipping around in his tricked out Tesla, Angel “cuts” water for Case. Hijacking pumping stations or unearthing long forgotten water rights, he is a detective and mercenary rolled into one. When an informant shows up dead in Phoenix, Angel is sent to find out what has happened. It turns out that a major power play is taking place, and the race is on to find a long-forgotten deed between the state of Arizona and a Native American tribe that grants Phoenix the rights to enough water to rebuild itself but to crush Las Vegas in the process. Angel is not the only one hunting down the old agreement. A shady West Coast conglomerate is watching closely, as is Lucy Monroe, a journalist and Phoenix native, desperate to save her city. Angel and Lucy are natural enemies, but the two realize the only way they may stay alive is by joining forces. The missing piece to the puzzle is Maria, a fifteen-year-old Texas migrant, blessed with street smarts, but burdened by getting herself into something over her head. Pretty soon the body count begins to rise, alliances come in to question, and it looks like either Phoenix or Las Vegas is going down in flames. The Water Knife is currently scheduled for an August, 2015 release from Knopf. For those who can't wait for more Bacigalupi, his latest YA book The Doubt Factory will be out this October. Your review is nice I was also looking for these kind of review. Nice detail share by you thanks you for this amazing article. I am also looking to make my blog http://guruofmovie.com better So that some one can also share detail of my blog on any other page. Bacigalupi has had pretty profound influence on my literary and academic interests over the past six years since I read The Windup Girl and the stories of Pump Six. Back in 2008, his work captured my imagination in a way that led me to engross myself in climate change, peak oil, and other related limits to growth. Bacigalup has an impressive ability to sketch out a near future Earth where human societies stagger through the consequences of the industrial expansion that we are currently enjoying. That's why the cover of The Water Knife is so disappointing...while there may be a Southwest Art motif that I don't quite recognize under all of those blue lines, overall, the cover seems quite slapdash, especially when compared to The Wind Up Girl and Pump Six's covers. Still, I'm very much looking forward to the new book!